Johnny Leon reached on an error in this July 1991 game with high-A Prince William and few batters later, he tried to score, according to The Frederick News. Leon came around from second on a single, but he got cut down at the plate, The News wrote. "I was just trying to hit my cutoff man and he decided to let it go," Frederick Keys outfielder Jason Alstead told The News of the play. "I knew I had a chance to get him." Leon made the run for home in his second professional season. Soon, however, his career would be cut down just like he was on that throw. Leon played just those two seasons. He never made AA. 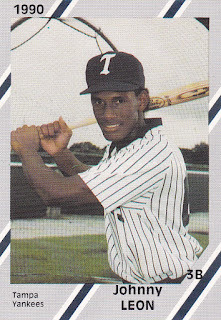 Leon's career began in 1990, signed by the Yankees as a free agent out of his native Columbia. Leon started with the Yankees in the rookie Gulf Coast League. The infielder got into 54 games and hit .294. He also hit one home run and knocked in 25. Leon moved to Prince William for 1991. He singled and scored in a July game. He then one of his four home runs to lead off the scoring in an August contest. Overall, Leon hit .228 over 51 games for Prince William to end his career.